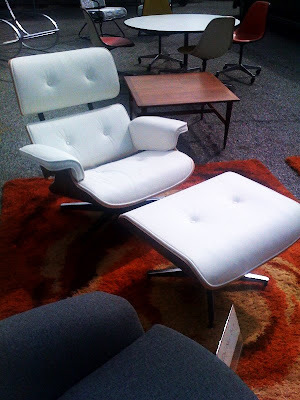 This beautiful Eames (not Eames-style, Eames) chair is available at Foothill 5 Fifty in Glendora Ca. It's possibly the most amazing place I've ever seen. Theres a giant showroom packed to the ceiling, and then a 1 acre lot / warehouse out back filled as well. Furniture in all stages of wear and restoration, and not at prohibitive prices, even for the perfect pieces. Casual modern collecting as it should be - fun again. They constantly have Craigslist ads, so take a look at some of their current offerings there, and you'll be able to see the contact info, and address on each ad. Bill is a nice guy who actually forced me to sit on this amazing lounge (there was a sign "do not sit" and I'm a stickler about respecting signs.) In the end I worry about the color being wrong for me, I think I need a black one instead. But having only seen knock-offs before, I was quite impressed with how beautiful this chair was. The visible edge of the plywood has got to be seen to be appreciated. Theres so much there it's overwhelming - I think I need to look more carefully though their ads and go up again with a plan to buy.